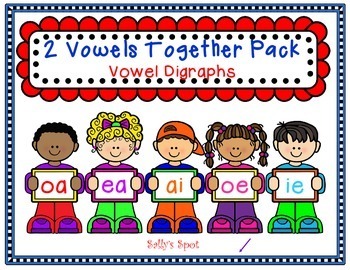 This long vowel digraph pack includes 7 activities and 19 worksheets working with oa, ea, ai, oe, and ie. The activities and Worksheets are listed below. The children will color the pictures, cut them out, and glue the picture above the word that names it. This can be used whole group or small group. The children will color and cut out the pictures. They will then sort the pictures by what vowel combination they hear. This can be used whole group or small group. There are 2 different sets of pictures to sort. There are 12 segmenting cards with 4 – 6 pictures on each one. The children will spell the words using letter tiles or dry erase markers. These are great for literacy stations. The children will color the pictures and cut them out. They will then find the rhyming pairs and glue them in the boxes next to each other. Last they will spell the words underneath each picture. The children will color the pictures and cut them out. They will then find the pictures that rhyme with ‘toe’ and glue them in the boxes next to it. They will do the same with the word ‘tie’. Last they will spell the words underneath each picture. Draw a line from the word to the picture that names it. 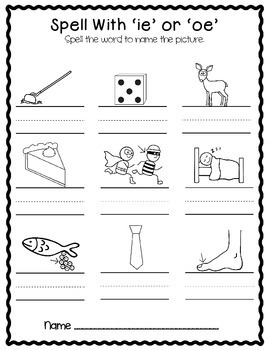 There are 5 sheets where the children look at the picture and spell it. There is another sheet that goes with this one for differentiation. 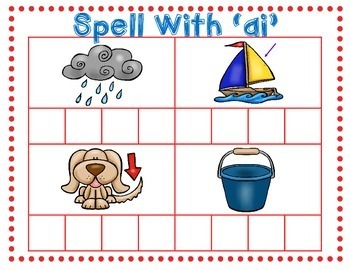 The children will spell 5 of the words that are on the previous sheet and write a sentence using the word. What Sound Do You Hear? The children will color the pictures in which they hear ‘oa’ red, ‘ea’ blue, and ‘ai’ green. There are 7 different handwriting sheets. 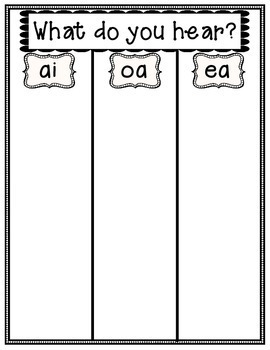 The children will trace over a word with a vowel digraph and then write it 3 – 4 times.